From my ‘in depth’ research before I left the UK I’d worked out that it was a shortish walk from my hotel to Victoria Spirits HQ, so considered the car-based coordination that had been organised slightly over the top. 20 minutes later, after driving down a variety of major roads in and around Victoria, we pulled down a wooded driveway a significant distance from the centre of town, and I started to doubt my map reading skills even more than I usually do. 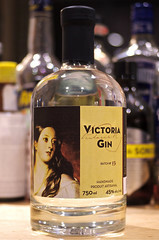 Victoria Distillers started out as a winery, using both grapes grown on Vancouver island and the nearby Okanagan valley (which I need to investigate more – I’ve heard good things but not much/none of their wine seems to leave Canada) but started producing gin in 2006. With the unreliable grape growing season on the island and expensive Okanagan imports they found that spirits production was something that liked more and dropped wine production about 5 years ago. They’re still a small distillery, and while they are looking into potentially expanding production they currently fit very well into their footprint – a tasting room and shop above a garage/workshop containing stills, bottling line, labelling machine, office and barrel storage. It’s compact and seems to work rather well. 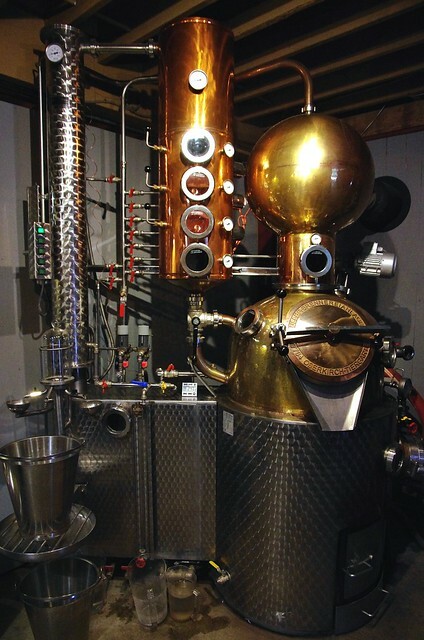 At the heart of the operation is a German-made Müller Brennereianlagen copper pot still, 210 litres maximum capacity and heated with a water jacket. The difference between it and other small stills I’ve seen is that it is currently wood fired, although they switched over from logs to compressed sawdust bricks a while back to help increase the sustainability, and reduce the pile of wood that they needed. Their water comes from a spring on the property, both carbon and reverse osmosis filtered for purity. Their distilling not a short process, with each batch of about 50l of gin taking the best part of a day to produce – they steep the botanicals overnight in 70% ABV spirit, cut it to 35% for distillation, fire up the still, leave it for a couple of hours to come up to temperature and then collect a heart cut at between 70% and 75% ABV of about 50l per run, taking about 5-6 hours including heating up time. They’re already doing quite well for sustainabililty, with their sawdust bricks sourced locally, the head cut being processed into biofuel, and about 300 litres of water used per run. That’s still not an insignificant amount of water and they are looking into heat reclamation and water recycling, especially as they plan for expansion and look at the potential for bringing in another still. 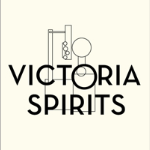 Their flagship product is Victoria Gin, a one-shot London Dry style gin with 10 botanicals – juniper, angelica, rose, star anise, orris, cinnamon, coriander, orange peel, lemon peel and ‘a mystery ingredient’. There was much prodding, poking and nosing of a bowl of crushed up twigs that was labelled as the mystery ingredient and it took someone with a much more North American upbringing than me to identify it – Sarsparilla. As a root beer hater it’s not a flavour that I’ve been exposed to much, but in it’s raw form it had a touch of twiggy cinnamon to it. With only 50 litres of gin produced a day there’s a lot of potential for inconsistency, which Victoria Spirits get round using something akin to a solera system. Each run is married and diluted in a 3000 litre holding tank, with later runs having their recipes tweaked to ensure that the balance of flavour in the tank sticks to the profile that they are after. They bottle from the tank and mark each label with the batch number, only incrementing it when the tank is significantly topped up. Bottling and labelling is all done on site, using a small filling machine and a handcranked labelling machine, and bottles are currently available at their own shop upstairs as well as in liquor stores in BC, Alberta, Ontario and Quebec. 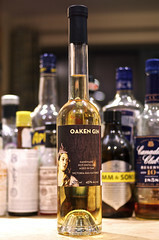 Along with the regular gin they also produce an aged version – Oaken Gin. They drop the gin down to about 65% and then fill it into small oak casks with oak chips. They leave it to mature for a length of time varying between months and about a year before blending together various batches, diluting and bottling. Their third regular product is Hemp Vodka, a single botanical distillate using hemp seed kernels to add a nutty flavour to the spirit. On the nose it was sweet and light with grain and hazelnut shells. To taste it was oily and soft, with sunflower seeds, and a sweet hazelnut nuttiness. It finished creamily, with a hit of what I’d imagine hazelnut ice cream to taste like. When they switched over to producing exclusively spirits the company was left with a stock of wine of varying levels of quality. Instead of trying to sell it as it was they decided to distill it all and make a range of wine based spirits. Some were awful and were quietly hidden away, but a few worked out rather well and they still have a few bottles left at the distillery – Peter treated us to their Merlot Eau-de-Vie. On the nose it had lots of big red wine notes – sour cherries, touches of leather and tannic fruit skin – although all slightly sweetened. To taste it was soft and packed with light, juicy red wine fruit and a touch of woody spice. It finished spicy and warming, with red grape hints. Not what I expected at all, with lots of fruit and obviously from a base of red wine. Annoyingly this means I may now have to investigate unaged grape spirits along with all the other boozes of the world, rather than writing them off as being ‘all a bit like dodgy grappa’. Ho hum, such is my lot. The last spirit we tried was the focus for most of the gang visiting – their whisky. As yet unreleased and tentatively named Craigdarroch, this is an ongoing experiment that they hope to have small amounts of on the market within the next few years. They get their wash from the nearby Phillips Brewery, who make a 100% malt mash with Canadian 2 row barley to produce a 9% base beer. This is then double distilled at Victoria spirits in a particularly long-winded process, going from 9% to 45/50% and then up to 70/75% in the final distillation. They cut their rectification column out of the spirit’s path through the still and need a mammoth 4000 litres of wash to produce 180 litres of spirit. Based on my rough back of an envelope calculations I think it takes them a month of solid production to produce enough to fill a single full-sized barrel. Initially they filled a number of smaller ~40 litre new charred oak casks, but after a year they reracked them into first fill Heaven Hill barrels with some new spirit and have since left it for another year. It’ll hit the three year mark and officially become whisky later in 2013 (October or November from my reading around) and have been putting samples in front of whisky fans for a while, with great results. We tried it at around the 50% mark. On the nose it had dark toast, Weetabix, Coke syrup, saw dust and a smattering of red fruit. To taste it was obviously quite young spirit, with sweet and sour grain and a hint of caraway, and had a bit of new oak rubber, but also had lots of brown sugar syrup, ginger, liquorice root and elegant black tea. Water brought out more floral notes and some pear drops, as well as more caramel and black pepper spice. It finished quite simply, with dry wood and sweet brown sugar. It’s definitely on its way and is already rather tasty, I just hope they can hold off bottling it for a little longer until it layers on a bit more maturity. Many thanks to Peter for showing us around and answering a pile of geeky questions. Thanks also to Jer and Crystal for putting together the group and driving us up there. It would have been a very long walk.